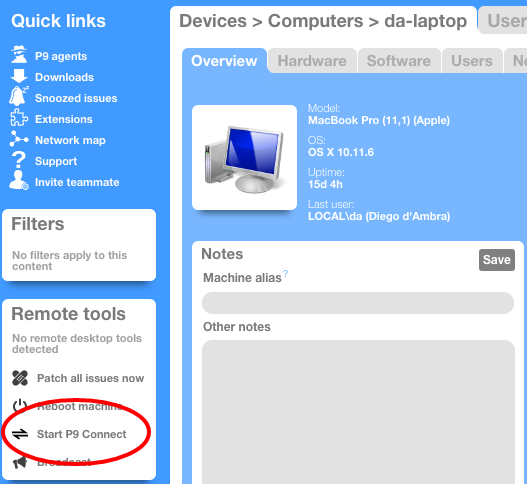 Currently it seems that P9 Connect can only be enabled after an agent installed by connecting to the machine by other means (RDP, other vendor remote connect software, physically at the machine). Please provide option in agent deployment and / or in the Dashboard to enable P9 Connect by default upon agent installation, and or provide the option to enable it from the Dashboard from the Device management panel. Pleased to announce that you now can remote start the P9 Connect client. Just navigate to a device and hit the "Start P9 Connect" button. Wait a minute, and you can begin a remote control session. Thanks for your suggestion. We agree that having this ability would make it rather easier to get started using P9 Connect. We are currently reviewing the security implications of adding this option. Once we have more news on this, we will update this answer.